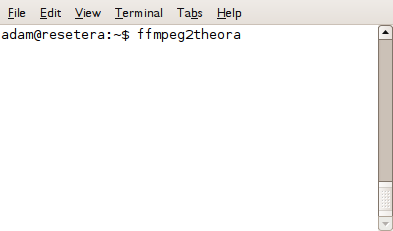 ffmpeg2theora is a very useful application that enables you to manipulate all kinds of video with the Ogg Theora video file format ('codec'). Running an application like this on the command line gets some getting used to, but in the long run, if you persevere, it becomes easier to do and quicker. You can also quickly cut and paste commands to do very powerful things without the need to endlessly figure out where the settings are kept in graphical interfaces. You may ask why it's relevant to encode media to Ogg Theora rather than more common video file formats like MP4. You might not have known but the format of video files is often owned by companies - this can sometimes lead to problems. If, for example, users only use proprietary video file formats like MP4 then the future for video applications is quite dark. While end users don't have to pay to use MP4 technology, the software creators do. This means that by only encoding to commercial, closed formats you are limiting the possibilities of using free, accessible tools in the future. Currently it's common to encode to the flv (flash) file format to embed video in webpages. Flash is owned by Adobe. However it is possible to embed Ogg files in internet pages just as easily. To give Web developers the encouragement to do this we should make our video content available in the Ogg Theora format.